Here's some happy news to wake up to: Dozens of ceremonies and weddings took place in Minneapolis early Thursday morning, as Minnesota became the latest state to legalize gay marriage. Gov. Dayton was so excited he proclaimed August 1 “Freedom to Marry Day." So Happy Freedom to Marry Day, everyone! The law went into effect just after midnight Wednesday, so to celebrate, an "extravaganza" was held at the Minneapolis City Hall, where 63 couples were married by the Minneapolis Mayor. More weddings were also scheduled to take place at midnight across the state, including Mall of America's Chapel of Love. And Minnesota won't be the only state with confetti: The first gay weddings in Rhode Island are planned for Thursday morning, as it becomes the 13th state to allow gay marriage. Now, it's estimated that about 30 percent of the U.S. population lives in places where gay marriage is legal. It's a long way to have come. In 1970, two men applied for a marriage license in Minneapolis, were then turned down, and filed suit. The Minnesota Supreme Court's response? The "institution of marriage as a union of man and woman... is as old as the book of Genesis." Legislators approved legalizing gay marriage earlier this year, and Gov. Mark Dayton signed the measure into law on May 14. 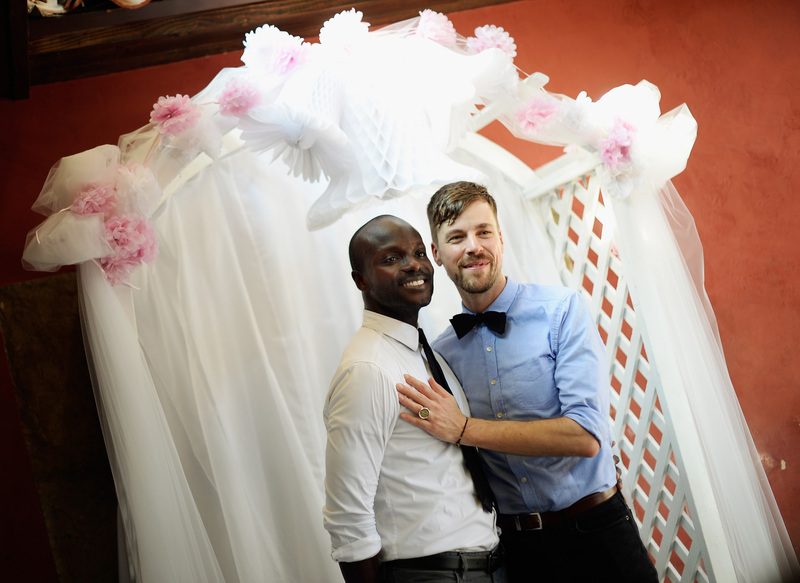 Officials are now estimating that around 5,000 gay couples will marry in the first year. Mmmm...wedding cake.